Growing thyme in pots or your garden is a great way to get the freshest, tastiest herbs for your cooking. And as it does best in poor quality soil with the minimal care needed, it's ideal for the beginner gardener. In the garden the evergreen perennial thyme plant is great for borders and rockerys, and once established will last for a good few years with minimal care. Read more about the actual plant. If you don't have much of a garden, this herb is perfect for pots or containers so ideal for a small area like a sunny patio. General Notes: You can grow it from seeds, cuttings, root division or the easiest way, buy a young plant from the garden store. Though it prefers a mild climate, it will withstand the cold and tolerate freezing temperatures. For the best flavour, plant it in well-drained, poor soil in a sunny spot. 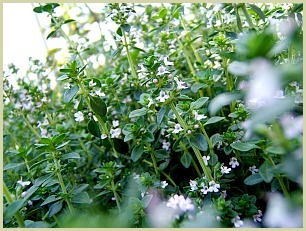 I grow a few varieties, but the one I most use in my cooking is common thyme. This is the type usually sold fresh and dried in the shops. Read more about this type. Sow the seed a few weeks before the average date of the last frost. This will vary greatly depending on where you live. Note: You can also start earlier if you sow indoors in trays and follow the instructions above once the seedlings are large enough to handle. This method is particularly ideal if you have limited space. A well draining soil low in nutrients is best for container growing. You can use seeds and follow the instructions above, or cuttings or root division are suitable. Water infrequently and cut back after flowering to encourage new growth. You can also separate older plants. Just dig one up and gently separate the roots into 3 or 4 divisions before replanting. This herb doesn't really suffer from these two problems. But if you do get aphids, treat with a horticultural liquid soap solution. Note: They may rot if they get too wet in the colder months so do not water at all then. Early Spring: Sow seeds and trim back older plants to encourage fresh leaves. Spring: Plant out seedlings and bought herbs. Summer: Take cuttings. Cut back after flowering to prevent them getting too woody. Autumn/Winter: If the weather is significantly below zero in your area, you can add some straw or mulch to their base for added protection. Do not water at all over winter. As long as you don't overpick, you can pick the fresh leaves all year round for use in your cooking. You can even make a healthy cup of tea! If you're planning on growing thyme for drying, wait until it just starts to flower then snip 5-6 inch cuttings, dry and then crumble and store in a jar out of direct sunlight. Whilst the herb will carry on producing leaves for a good few years, it's a good idea to start afresh after 3-4 years or to divide and replant the older plants as they can get a bit woody.